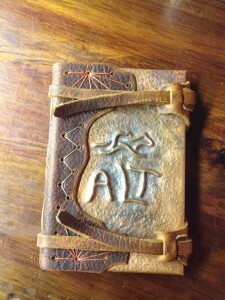 This was a great project for an aspiring horse trainer who wanted a personalized and durable journal to jot down notes on his horses. It is an initial journal with a double slip clasp and nice starburst stitching on the cover in a red waxed linen thread. The copper cover was worked on the anvil to create a pebbled texture that complimented the leather. There are 9 signatures of 90 lb Canson paper for a total of one hundred and eight pages. Custom copper and leather journal, “Doctore”.